I got my AWS membership credential in the mail recently– I have been a member for 20 years! If you are not familiar with the American Welding Society. 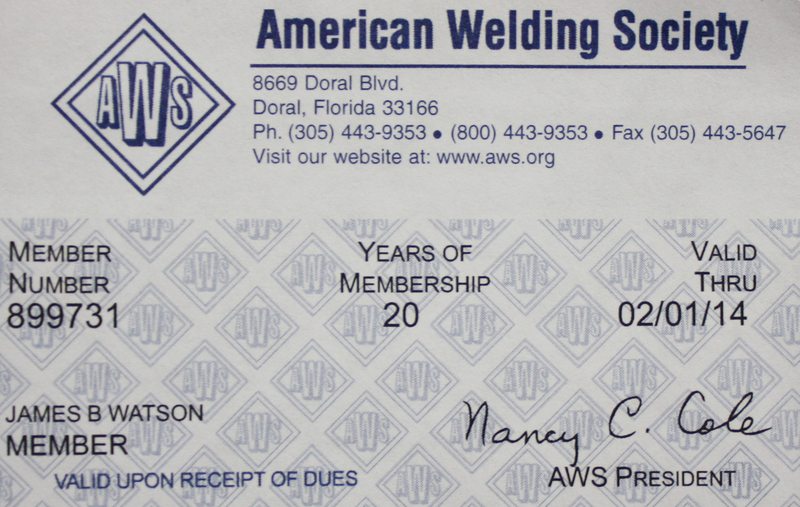 The AWS is the welding professional, standards, and certification organization. I would encourage you to get involved, check out there web site and if you want to know more drop me a line and I would be happy to help you get set up with the benefits of an AWS membership. Check out the signature from the AWS President–Nancy Cole! First woman president of AWS! We’re interviewing her now for an upcoming feature on CarmenElectrode.com where we regularly profile women welders–the New Rosies. AWS is leading the way in advancing the technology of welding, making membership a great way to stay up-to-date with the latest and greatest (some of which you’ll find over at Arc-Zone.com) with the Welding Journal magazine, tons of Technical Publications, Welding Educational Programs, and Welding Certification programs, it’s also a great place to mix and mingle with your colleagues in the industry. Each year the AWS holds a trade show, FABTECH International and the AWS Welding Show, and on the local level you can join your AWS chapter. And, if you need to up your skill level– or you (or someone you know) is interested in getting into the welding industry, the online Welding School Locator will get you started. AWS also offers scholarships, and welding student chapters. UPDATE: just learned that Nancy Cole is the 2nd woman president of AWS! either way, it’s big news and nice to see!